The Le Sigh: Tracks: Pastelpower - Jean-Paul / Oh, Louie! Tracks: Pastelpower - Jean-Paul / Oh, Louie! Rise and shine to Pastelpower, yé-yé-inspired bedroom pop from Singapore. In early October we shared a French Oldies-themed Monday Mix that featured songs by our favorite yé-yé artists. This mix was also very much so inspired by French filmmakers from this time, or La Nouvelle Vague. Pastelpower, the side project of Obedient Wives Club lead guitarist Cherie Ko, is surely influenced by this 1960's music and film movement. Pastelpower started on a whim when Ko was fooling around on her keyboard one night this past September. The project is rather sweet – Ko's high-pitched vocals infused with poppy electronic instrumentation sounds cute but also beautiful (although some might like to believe these kinds of things are mutually exclusive – I do not concur). Like the yé-yé and Godard girls that came before her, Ko sings with the kind of deliberate naivety that make one think of pastel hues, vintage floral patterns, and delicate french pastries. While Ko does not have any albums out currently, she has two songs in particular "Jean-Paul" and "Oh, Louie!" that we're entirely smitten over. "Jean-Paul" is a minimalistic bedroom pop ode to none other than heartthrob Jean-Paul Belmondo from Jean-Luc Godard's Une Femme Est Femme. In one bouncy verse, Ko sings "Hey mister / What is your name / Is it Jean-Paul? / Or James Dean / Cause you're so dreamy." With Valentine's Day on the horizon, this song hits a soft spot for me, especially considering how fickle I tend to be in love. "Oh, Louie!" is a slow and dreamy song that Ko posted last night. Juxtaposition between melody and lyrical content is evident in this one – Ko makes heartbreak sound happier than we know it is in reality. This track is also filled with floating harmonies that again remind of 1960's pop hits. According to Ko, this one is inspired by John Waters' Polyester, a film I'm now inspired to see. 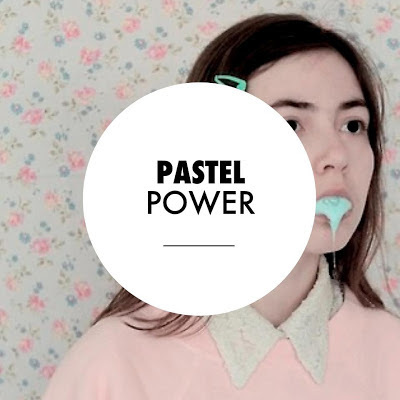 Check out Pastelpower on BANDCAMP.